Home › Medianism › Does The Median American Care About Median Income? Does The Median Even Know? Does The Median American Care About Median Income? Does The Median Even Know? John Cassidy put together some recent findings on inequality and showed a famous chart from Emmanuel Saez, of Berkeley, of the share of pre-tax income enjoyed by the top 1% richest earners in America compared with everyone else. The surprising finding is that there’s little evidence of a surge in support for redistributionary policies. In fact, a fitted regression line shows the level of support falling slightly during the last three decades. Since 2007, it is true, there has been a rise in the number of people answering the survey question in the affirmative. But Kuziemko’s take on the data was that it’s too early to say whether this represents a permanent shift. This is confirmed by Gallup polls which also show that the median American doesn’t care that wealthy Americans have kept almost all the nation’s productivity gains since the 1970s. One theory for why the median American does not care about median income is that most Americans don’t know that inequality has risen which has hurt most Americans. That is probably because the roughly 30% of Americans with a college degree have had modest income gains and they are the pastors, journalists, and teachers whose priorities largely determine the national dialog. It may also be due to temporary mitigating factors like increased indebtedness which has helped the median household maintain their standards of living despite decreased incomes and the important gains in women’s employment which have also helped most households maintain consumption levels. 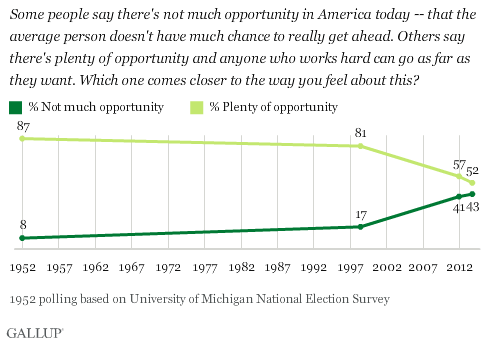 The median American could be reacting to rising inequality like a frog in a pot of hot water. Not the mythological frog that allegedly just sits there and gets cooked, but a real frog which will continue to tolerate increasing discomfort for a while because of not wanting to spend the energy to risk making a change. But eventually the heat gets too uncomfortable and it leaps out with a splash. This is often how social revolutions happen. It is more like an earthquake than a gradual slide down a slippery slope. The tensions build beneath the surface without anyone noticing until suddenly there is a massive shift to a new equilibrium. Personally, I would prefer to avoid revolution. Gradual transitions are less likely to have unintended consequences. To avoid the violent possibilities of revolution, it is important that Americans learn about how the economy has been gradually transforming itself since the 1970s. A democracy is supposed to be a kind of dictatorship of the median and if the median cares about its own well being, it should take some steps to fix things before inequality reaches banana-republic levels. This is entirely doable. In fact, every other rich nation is already doing it. Another of Cassidy’s graphs, from CUNY political scientist Janet Gornick shows how much inequality exists before and after government taxation and transfers. Unsurprisingly, the US has the highest inequality of all rich nations in the end, but it turns out, that is mainly due to the fact that the US government does less than anyone else to reduce inequality. One striking thing about this chart is that the U.S. figure for pre-tax inequality (0.57) doesn’t really stand out. In fact, according to this metric, the United States has pretty much the same level of pre-tax inequality as Sweden and Denmark, two countries that are usually thought of as highly egalitarian. 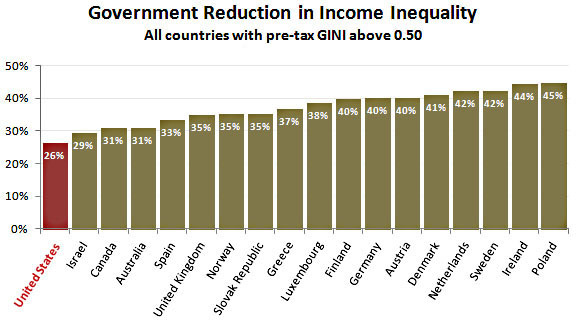 The United Kingdom, Ireland, and several other countries have pre-tax levels of inequality that are considerably higher than the level seen in the United States. Where the United States does stand out is in the level of inequality after taxes and transfers. Judged by this metric, the United States is the most unequal of all the twenty-two countries. As Gornick said at the conference, what this means is that, contrary to popular perception, our system of taxes and transfers does less to ameliorate inequality than the systems other countries have. Kevin Drum re-charted the data to show the difference between the two lines to show how little the US does to reduce inequality. They say it looks like a wave, but it looks like a fist to me! 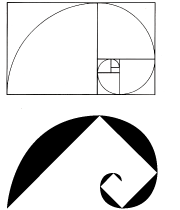 Is it a revolutionary’s logo under the innocent guise of a Fibonacci spiral?